Oh look! It’s our Little Girl! The day was dreamed up by Wayne Morris (yay, Wayne!) to honor his sister and her beloved black cat. The purpose of the day is to celebrate black cats and to dispel some of the stereotypes of black cats being bad luck. Some cultures believe black cats bring good luck. The Japanese believe black cats bring good luck. Scottish culture says that if a stray black cat comes to your home, it brings with it good luck to the household. And ancient Egyptian cultures treated black cats as royalty. Others, though, think black cats are bad luck. Gamblers believe that if a black cat crosses your path on the way to gamble, it’s a sign you should not go. And Pilgrim settlers of the US saw any old woman with a black cat as a witch, If the villagers decided she was bringing bad luck to the village, both the old woman and her cat would be burned at the stake. Graybie Baby photographs best in front of neutral colors. During the Middle Ages, humans killed black cats because they saw them as evil. As a result, the rat population grew and helped to spread the bubonic plague. I don’t think that was the cats’ fault. Maybe it’s stupid humans that should be feared. There is no statistical data that supports the adage the black cats (and dogs) are less likely to be adopted from shelters. Anecdotal evidence suggests the problem lies with the difficulty in photographing them. So the smart shelters are working with lighting and backdrops to make black cats more appealing. Here at the Rumpydog household, we share our lives with two black cats- male Graybie Baby and female Little Girl. And while Jen may be many things, a witch she is not. So let’s celebrate the beauty and grace of the black cat, and reassure folks that black cats are not evil…… unless you forgot to feed them at the proper time, that is. Better nobody say MY kitty is bad luck! Tell us about a special black cat in your life! Yeay to all black cats! Black cat or no, the Pilgrims didn’t need much of a reason for burning women, cats… and just about everything else, at the stake. In fact, the Pilgrims – just like Curley of the Three Stooges – far preferred a hot steak over a cold chop. A mind-numbingly ignorant population, it’s a miracle any of them managed to survive. Look around….. I see many following their path. I have a heart for black kitties, they are great! And if you share your crib with a black kitty you are always safe from bad luck and monsters. There is absolutely nothing wrong with black cats, they are awesome. And, you know I have a thing of black dogs! *for black dogs* I got so excited I couldn’t type! We have 2 black cats and keep them inside to protect them from stupid people. Ours stay inside also. Just safer all the way around. Me too! Black cats ROCK! M’s first kitty was all black. He lived to age 19 and never once brought them bad luck., I’m half black. Black is beautiful! Wish the general public would get over that stereotype and realize black cats are just as good as any other color of cat. I am more black than white, and I make everybody happy! woo woo woo! Sounds like a lot of good luck there, if ya ask me! We love black cats! Some of the sweetest and most amazing kitties at PAWS are house panthers! House panthers. I love that description! woo woo woo! House panthers… I love that too! Once I saw a black cat hiding under a minivan. It was good luck, because Mom said, “Leave it.” and I did, and I got a treat! Lucky! Now THAT is my kinda luck! woo woo woo! I remember you mentioned that once. I think it’s great that some people see them as good luck! Our black cat, Shadow, was loving and shy. We were lucky to have her with us, along with another cat, Bond … Jane Bond, for nine years. She is missed. Stereotyping an animal or a human based on color is just dumb. I’m heart struck that these beautiful animals are singled out based on their color. 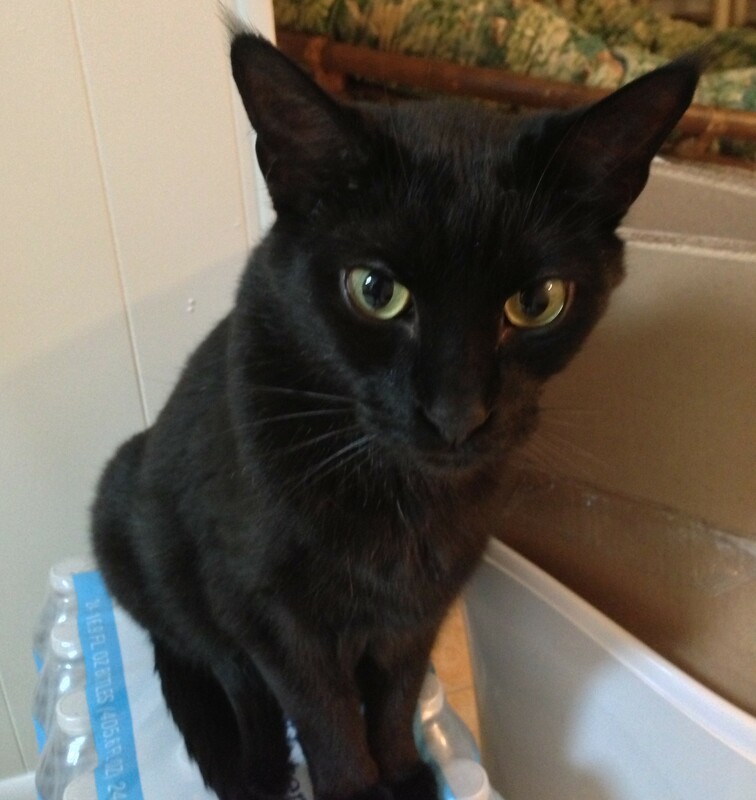 Well, humanity is never at a loss for stupidity…..
Biene was our black cat. She passed away from cancer two years ago. Mom adopted her from a cat rescue when she was about six months old. She had been abused and did not like humans. Mom spent twelve years trying to tame that poor kitty. She had her moments and she knew Mom loved her, but her life was sad as she always lived in fear. Mom did the best she could but there was no reversing what happened to her as a kitten. She had the most beautiful fur of any cat we have ever seen. Hopefully she is now free and happy! How sad…. I hope she is now happy too. That is so incredibly sad….. I completely agree that black dogs and cats are difficult to photograph and to draw! When I tried to draw my black dog Sephi, it was difficult to add shading because she’s black. So I added white or gray highlights instead which make her look black and white instead of black. Tough. You mean I have to appreciate Scratchy, the black cat I live with? This is terrible! I sure hope Scratchy doesn’t read this post. I’ve got to keep him away from the computer today. Let’s hear it for our house panthers! How wonderful. I will share. I will be hosting a black cat appreciation month in October and I will link this article if you don’t mind. Honestly, I used to be very frightened of black cats after one scratched me badly when I was little. But then when I was 11 I was at my friends house playing computer games when I felt something rub against my leg, thinking it was their dog I reached down, fussed it without looking and carried on playing. It sat on my feet, rubbing against my leg for a good ten minutes and then I happened to glance down and realised it was their black cat, Sabrina. Noticing she had my attention, she jumped up onto the armchair and cuddled up next to me. I spent the whole evening there stroking and talking to her. Sabrina passed away last year and I was as heart broken as my friend because not only was she beautiful, sweet and friendly, but she cured my fear and has helped me grow to love other black cats. Sabrina knew just what you needed. I’m so happy you got the chance to meet her and let her offer you some healing energy. woo woo woo! I adore black cats! Good post and nice blog. Yes, black cats are spectacular! Great post – we have to keep spreading the good word about them! Black cats are awesome! If you don’t believe me, ask them! Our staff, Meowmie Debby, says that communities in the Ozark Mountains have also considered black cats good luck, because they scare away evil spirits. Purrs, headbonks, and waggawaggas to all of you! I think I like the Ozark Mountains. Must have been settled by Scots or Celts. 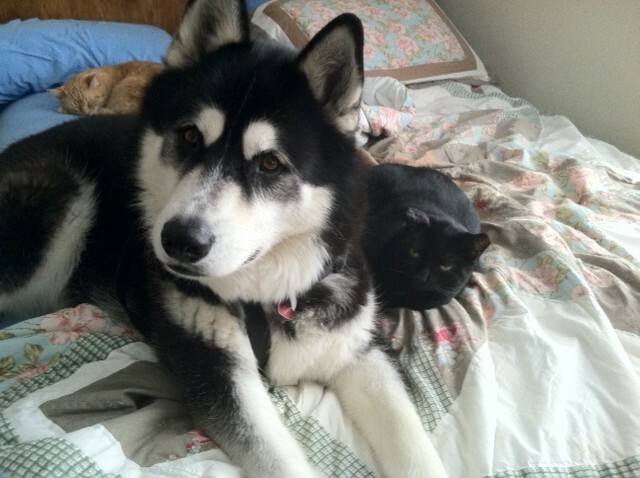 Hi Rumpy, I have a fourteen year old indoor black kitty who loves his two doggie-sisters. He picked me out at the shelter when he was teenie-weenie, coming over to me with an outreached paw and saying, “you need a cat, and I’m it.” He is the most talkative cat I have ever known! Whoa! That is way cool! You are so lucky to be adopted like that. Our special black cat is Ernie. He is the funniest, friendliest cat! The mom adopted him BECAUSE he was black…and she’s never regreted it for a minute. I’m not a cat fan – I have an allergic reaction to them – but I find black felines especially beautiful! We LOVE black cats, and celebrate them here every day! 🙂 Hopefully, there will come a day when they are seen as wonderful kitties, who just happen to be black. My Jack was black, a loving wonderful cat, a gorgeous boy, forever missed. We have two gorgeous black cats and a black dog here in Teddy and Tottie Land and they have brought us so much love and joy. Black animals are so handsome and regal looking. Our lives wouldn’t be the same without them. Here’s to Black Cat Appreciation Day! You know I’ve never had a black cat before I don’t think… but I’ve met a lot of them and they seem just as nice as any other cats. Some of the oldest cats I’ve ever met were black ones. I used to be so superstitious about black cats and in fact I hated all cats… and then I fell in love with a black cat. Bubi was my ‘heart’ cat and was a most special cat. Sadly he passed away a few months ago but he gave me the gift of a lifelong love of cats and especially black cats. I also considered black. It my pawty too? I know the human really got her beady eye on a black cat (even blacker than me!!) at a local shelter, but she has got to get MY say so first!! What a lovely color combo between you two. 😀 Love how the bright eyes really pop on black cats. We love black cats! Gee…I wonder if our Binx realized it was his special day???! We better go slip some extra treats to him! Don’t let daughter-in-law Alexa’s black cat Loki read this. He already thinks he’s royalty! 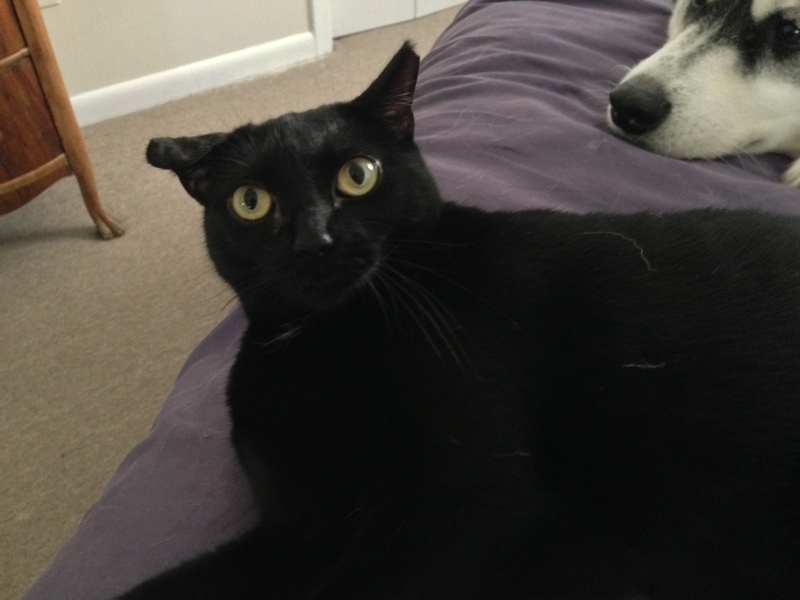 I have a black cat named JOFFREY-he is a rescue cat from Philly-I like your blog. I love my black cat diva. She loves butter, and being the queen of the house. Every morning she wakes me up by biting my fingers. She certainly controls the other animals in the house. I love this post! One our cats is black. It is extremely hard to photograph her- unless the lighting is *just right* her face looks like a giant shadow because her nose and lips are black as well. Using a flash makes her eyes glow creepily. We have found that natural light in particular or a large light in front of her as opposed to behind her allows us to see her more easily in photographs. I’ll have to get my human to try that!